Okay, it’s part of the club’s marketing to thank season ticket holders with such gestures, but with Paul Lambert, you always get the impression he’s not interested in the club’s business beyond his team, coaching staff and supporters, and it shows in his recent letter to Villa’s season ticket holders (below). As we’ve mentioned before, we’ve always liked the old-school nature of Lambert’s approach. He’s not bothered about the media, selling shirts, tickets or cashback schemes, he’s all about the brass tacks of the team and the supporters. Now refresh my memory… what did Alex McLeish say again in his letter to season ticket holders? On behalf of the team and my staff, this is a genuine note of appreciation for your ongoing support of the Club and for the strong contribution you have made to the vibrant, passionate atmosphere that has typified our games here at Villa Park and at away games up and down the country. From the outset, we knew that establishing a tight, robust relationship between the fans and what has essentially become a new group of players in the Villa shirt would be crucial in our efforts to build the Club again. The support of the fans has been a key element in the team’s growth and emergence and that mutual bond has been very evident again this season. Collectively, we all want to see a team that is exciting, a team that wants to try to attack and a team that steps out in every game to try to win. We have started off playing really well, the team is doing well at the moment and this is very pleasing. Inevitably, we experienced growing pains last season but over the second half of the campaign there was a big coming together and a massive effort to secure the results which gave us that platform to continue to build and develop. We’re a different team from that now. Everyone can sense this and see it, too, and some of our results so far have provided a real measure of just how far we have travelled in not much more than a year. The level of performance has been particularly satisfying. Even the most dyed-in-the-wool optimist might have struggled to see too many points coming from the run of games we were dealt at the start of the season, including Arsenal away, Chelsea away, Liverpool and Manchester City. These teams will aspire to be right up there when the Barclays Premier League comes to a conclusion in May. That we competed all the way with each of them is testament to the work ethic, the sense of team and the quality within the group in addition to the powerful collective desire which underpins their effort on a daily basis. The players enjoy coming to work, they work hard, they enjoy representing this Club and they have taken upon their young shoulders a massive responsibility based on expectations which inevitably exist given the heritage and history we are proud to have here. Your backing of the team has helped enormously. It will continue to take time for the group to realise its true potential but the foundations are strong now, the players’ increased resilience will help them to deal with setbacks and to overcome them and the further strengthening of the squad that took place in the summer augurs well for its continued development. We won’t always experience days like we did against Manchester City, for the squad is still predominantly young, still learning and that level of consistency will be difficult to maintain. But that’s our challenge over the coming weeks and months – to continue to strive to move forward as a Club and to build on what we have, an ethos and a philosophy which sees the players and the fans at the very centre of what we want to achieve together. JoeLarner Yep. Late night brain fart! Cheers. 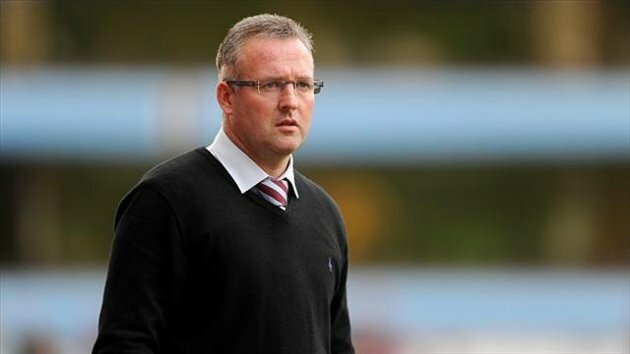 In Lambert we trust, Up The Villa!